Home / Previewing the yearbook / How do I see/choose the cover? Your front and back covers are the first pages you see in the Page Manager. The preview is only an example of the design that you have chosen – it doesn’t currently show any of the customisations that you have chosen like colour, images, or text, because our design team do that for you by hand when you submit your book. To select a design and customise it to your liking, you should click on the cover in Page Manager and the Cover Editor will be opened. Here you will see a large preview of the chosen design (without your customisations), and from the tray on the right you can pick from our available designs, customise it with your own colours, images, and text, and change the cover material and finish. To read more detail about how to customise your cover, please click here. 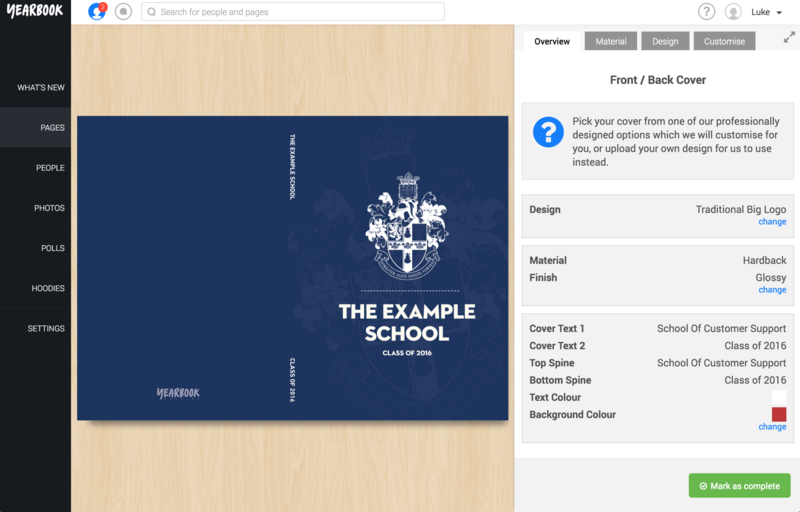 It’s not possible to provide a preview of the cover in the online system, however you will have the chance to review and approve a full preview of it before printing.